Honey Wheat Molasses Bread tastes just like the bread served at Outback Steakhouse and The Cheesecake Factory. 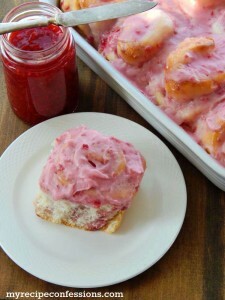 This bread is soft and fluffy with an addicting mildly sweet flavor. Now you can enjoy this famous restaurant bread at home! Bread making has always been a passion of mine. Nothing beats a loaf of homemade bread. I love the warm and comforting aroma that fills my home as the bread bakes. My Grandma Cope and my Mom always made homemade bread. Coming home from school and smelling the homemade bread and finding a warm loaf of bread on the counter is one of my favorite childhood memories! I love when the butter instantly melts when you spread it over a warm slice of bread. I always loved it when we would visit my grandma and she would pull out a homemade loaf of bread and some homemade raspberry jam. She made the best homemade Jam! On New Year’s Day, my husband and I took our kids to Outback Steakhouse. It had been a few years since we had been there and I had forgotten about the warm brown bread they serve. My kids immediately started to snack on the bread. Of course they loved it, because who in their right mind would not? I knew as soon as we left the restaurant that I needed a recipe for their bread. 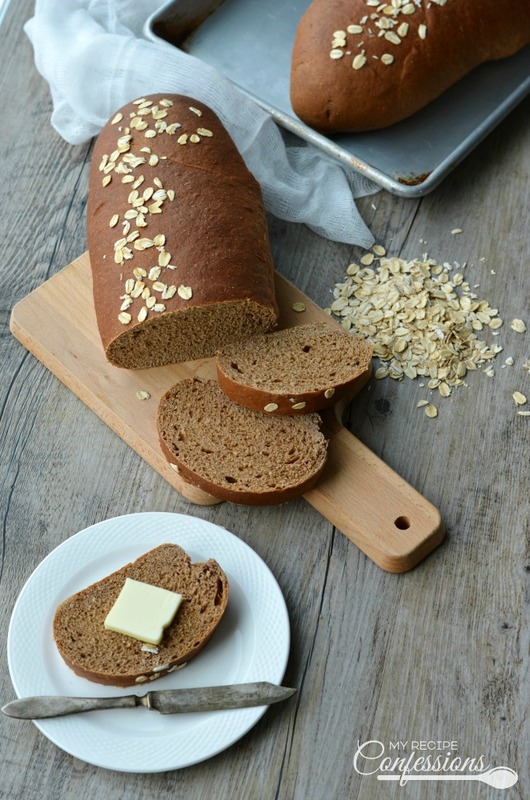 After playing around in the kitchen, I came up with this Honey Wheat Molasses Bread recipe. This recipe makes three oval loaves. Honestly, I could probably eat a whole loaf all by myself, it is that good! 1.This dough is heavier than regular white bread dough. You want the dough sticky but manageable. 2. Be careful not to over mix the dough. Over mixing will result in a tough, dense bread that lacks flavor. In your mixer bowl, dissolve the yeast and sugar in the warm water. Let sit until it starts to bubble and foam on top (about five minutes). Mix in the molasses, honey, canola oil, cocoa powder, coffee granules, and salt. Scrape down the sides of the bowl. Add the whole wheat flour and 1 1/2 cups of bread flour to the wet ingredients and mix on low speed until the flour disappears. Stir in the remaining bread flour 1 cup at a time and mix on medium speed until the dough starts to pull away from the sides of the bowl (see notes above). 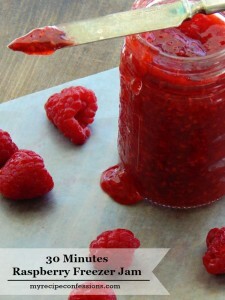 Turn the dough out onto the counter and knead for 2 to 3 minutes or until the dough is soft and smooth. Form the dough into a ball. Spray a bowl and a strip of plastic wrap big enough to completely cover the dough with cooking spray. Place the dough in the bowl and press the plastic wrap directly on top of the dough. Set the bowl in a warm place and allow to rise until double in bulk, about 45 to 60 minutes. Punch the dough down and divide into three equal portions. Form the dough into a tight oval loaf and lightly press the oats onto the top of each loaf. Place the loafs on a lighted greased baking sheet. 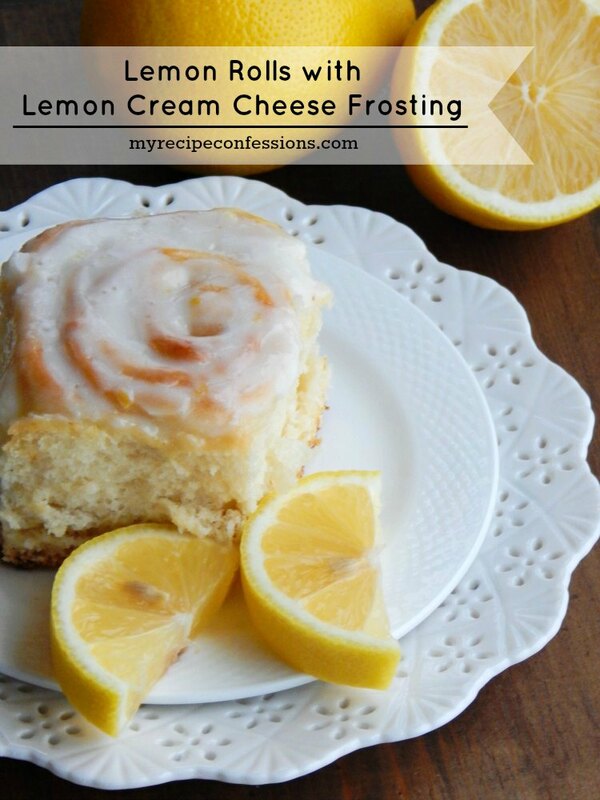 Cover the dough with a sheet of lightly greased plastic wrap. Place in a warm place and allow to rise until double in bulk. Bake bread for 25 minutes. Allow the bread to cool for 10 to 15 minutes before slicing. 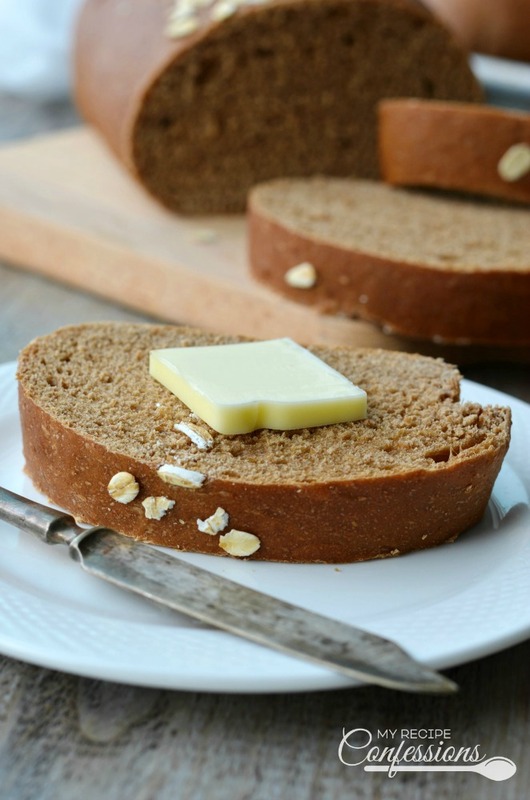 can this wonderful molasses wheat bread be made in a bread machine. 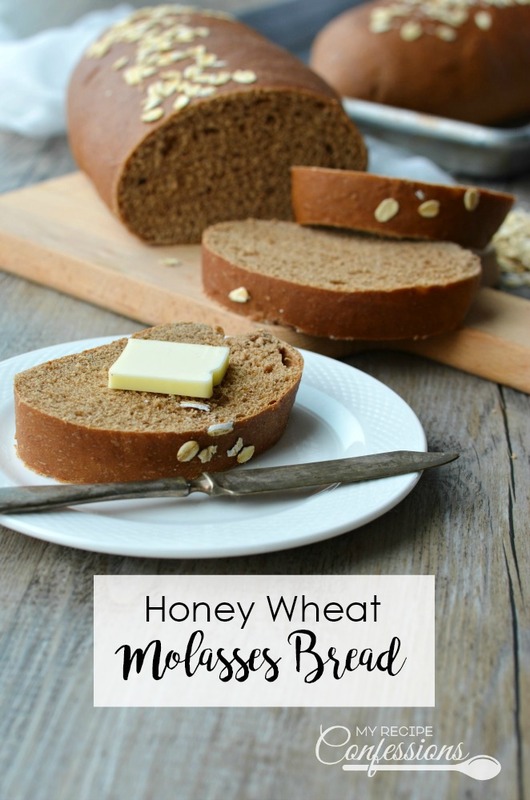 I have never made the honey wheat molasses bread in a bread machine. I can’t tell you if it would work in a bread machine or not. I’m sorry I can’t be more helpful. Dear Carrie, I love your recipes! Thanks for sharing. 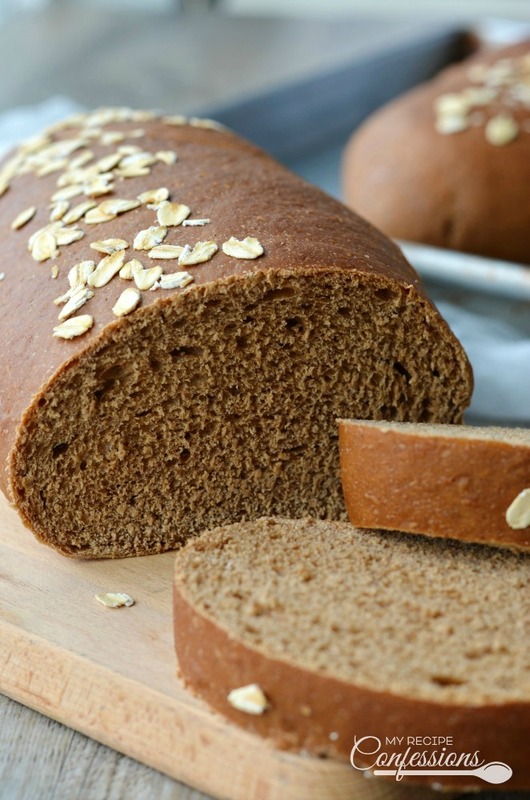 Is it possible to make the molasses wheat bread without the coffee granules? Will that impact the flavor dramatically? You are so sweet! I’m glad you are enjoying the recipes. You can make the bread without the coffee granules. The bread will taste more like wheat bread and less like the bread from Outback. But, it’s still delicious without the coffee granules. I hope this helps!